The Dry Arch Children’s Centre's are launching our Trauma Teddy Campaign to comfort children who have been subjected to distressing situations and trauma. The idea of Trauma Teddies was conceived by Australian Firefighters and has made its way across the world. 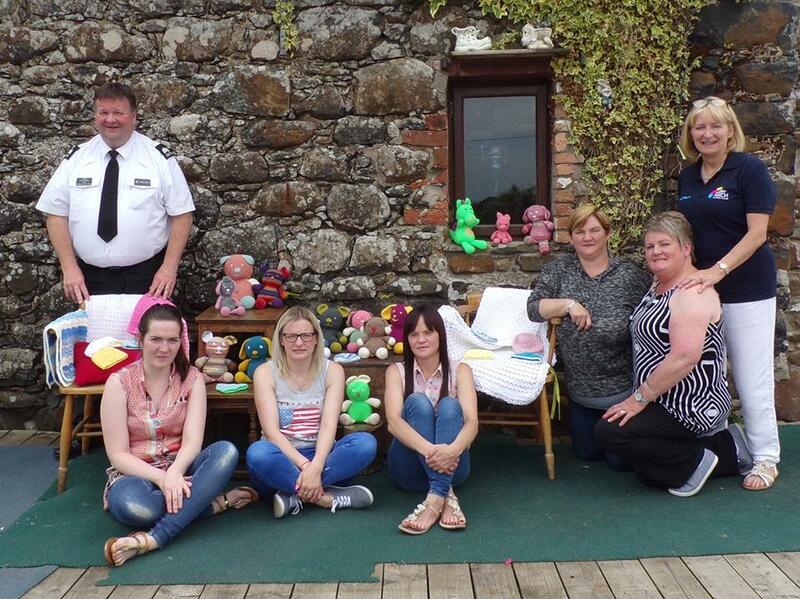 Trauma Teddies are made by talented volunteers and donated to emergency services such as the PSNI, Fire & Rescue, Accident and Emergency and Social services Teams. We have been donating small numbers of Teddies to the PSNI and other causes for the past number of years, however we want ensure that there is enough teddies for everyone, not only in our Council area but throughout Northern Ireland with your help. What is the Dry Arch Trauma Teddy campaign? The Dry Arch Children's Centre are working with our community partners to build a more trauma informed, resilient community in the Western Trust Area and beyond. We are currently working in partnership with the Trust to improve awareness of Adverse Childhood Experiences (ACE's) and the effects these can have on emotional and physical well being, particularly in later in life. We are asking for the support of the local community who like to be creative, or who would like to learn to be more creative, to volunteer their services and knit or crochet a Teddy or two.. if you cant see yourself crafting right now, perhaps you would like to get involved by donating some much needed wool....the best wool for Trauma Teddies is 8 PLY. If you don't know how to knit or crochet, you can contact a member of the Dry Arch Team and you could arrange to attend our Yarn a While knitting programme which is suitable for people of all levels. Sgt. Terry McKenna being presented with the latest batch of Trauma Teddies from the Dry Arch Children's Centre "Yarn a While" parents group. How will the teddies be given to children who need them? 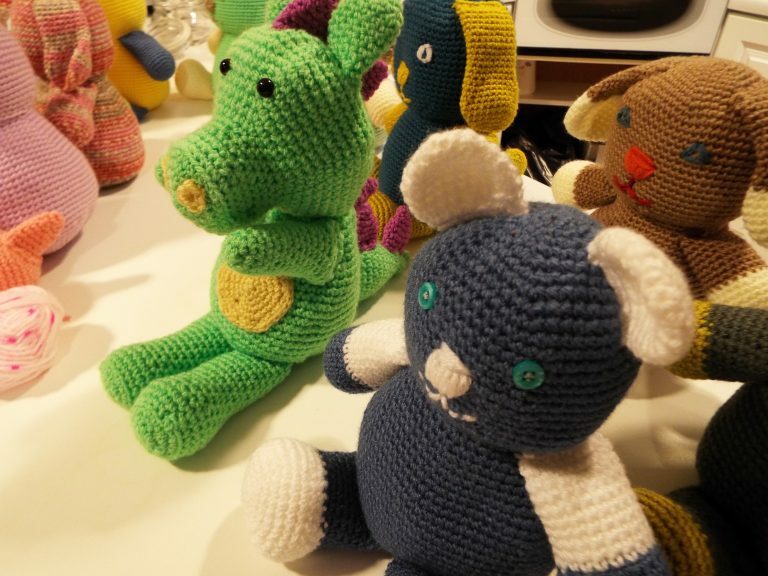 These knitted teddies will be provided by Police officers, Family Support Workers and others front line services to comfort children affected by traumatic events. Trauma teddies will be given as a simple distraction to help take a child's focus away from potentially upsetting circumstances and help police officers build a rapport and turn the experience into something less traumatic. As well as providing comfort to Children, Parents will receive information about how they can access support through our local Early Intervention Family Support HUB. Here are a few examples of Trauma Teddies previously knitted by the Dry Arch Knitting Group. How do you sign up and how can you get the teddies to the Dry Arch Centre? You can start knitting and donating straight away to help our campaign. To know how many people are supporting us we would love you to sign up to our Trauma Teddy Campaign - we will also be able to keep you updated via email of how the project is progressing. You can donate your completed teddies to the any of the Dry Arch Children's Centres in Dungiven or Limavady, or at you local police station. HOW TO MAKE TRAUMA TEDDIES? The Dry Arch Children's Centre have developed a full step by step guide on how to knit/crochet a Trauma Teddy. We are working on our own video tutorial, however you can watch this YouTube Tutorial here for now for a more in depth visual guide on how to make your Trauma Teddy. You can send us pictures of your teddies to info@dryarchcentre.org and we will post them on our Social Media pages and use them in email updates to everyone who has subscribed to the campaign.